There is no bigger lie. Words can injure and wound with devastating power. The passion that filled this boy’s angry response betrays the wounds that the words of his critic have inflicted on him. Today’s Second Reading from the letter of James also recognizes the power of words. James calls it the power of the tongue. Even though the tongue is small, it can do great things . . . for good or for ill. Like a small bridle that can control a large horse or a tiny rudder that can steer a great ship or a little spark can ignite an enormous forest fire, the tiny tongue is a mighty thing. James is skeptical about our ability to control the tongue. People can tame unruly animals, unpredictable reptiles and even free-flying birds . . . but not the human tongue. James says that the tongue is “full of deadly poison” and is “from hell.” It often brings the worst out in people. When the 8th Commandment sternly warns, “Thou shall not bear false witness against your neighbor,” it assumes right from the get-go that we use our tongues to destroy the name and reputation of others. We love to gossip and pass on the latest dirt about someone else. There is nothing like the power of the tongue when it comes to destroying friendships, communities, families . . . and even churches. The fabric of a community can be shredded by a few poisonous words manufactured by a few malicious tongues on a reckless Tweet or Facebook posting. James finally says that no one can tame the tongue. Even Jesus recognizes the destructive power of the tongue and the great damage that it can do to the church. In the Gospel of Matthew chapter 18 Jesus provides a very specific strategy on how to tame the power of the tongue especially in the midst of conflict and disagreement. If someone disagrees with you, you talk to him about it . . . . privately. If the difference persists, take someone with you. If it still persists, take two with you, and then to the church. If the difference still persists, “treat him as a Gentile and tax collector.” How did Jesus treat Gentiles and tax collectors? He never gave up on them. The most important step in this whole process is the first step. It is the first step that we want to skip. Why? Because more often than not, we are more interested attacking those with whom we disagree than in working out our differences with them. If we talked with him privately, we might discover that we are mistaken. Our differences might be resolved. Then we could not do what we really wanted to do all along: hurt him, discredit him and expel him. We prefer to wag our tongues and ignite a firestorm of gossip than actually to solve our problems. James has no patience with such behavior. We would call such behavior “hypocrisy.” James calls it “doubleness.” On the one hand, the tongue blesses God. On the other hand, it curses God’s people. James pleads, “My brothers and sisters, this ought not to be so.” This kind of “doubleness” makes about as much sense as a spring pouring forth both fresh and brackish water, a fig tree bearing olives or a grapevine bearing figs. Why do we engage in such “doubleness?” The gruesome truth is that we are filled with a “deadly poison” and “a restless evil.” We are sinners. Every sinner since Adam and Eve has wanted to decide for himself what is good and what is evil. We appoint ourselves the judge and jury of other people’s lives. We take great delight in righteously exposing the failures of others. In such holy wars, there is no better weapon than the tongue. Gossip has great appeal. It begins with our own insecurity and self-doubt. Do our lives matter? Will we count for something? Unsure and uncertain, we will do whatever it takes to make a name for ourselves, always with an eye cocked to the heavens or to the horizon hoping that God is watching and approving. Our untamed tongues wag. We tear down others in order to build ourselves up because according to our own sin-infected logic we believe that it will gain us brownie points. Tabloids and gossip columnists clutter the internet with their venom because they know how we all delight in discovering that the rich and famous are no better than we are. Such wagging of the tongue is music to our ears. This is the truth: Flesh and blood will never tame the tongue. Regardless of how hard we try to discipline ourselves, our sinful nature always gets the best of us. Our only hope is that our tongues will be tamed by another tongue. . . God’s tongue. When God speaks, there is hope for the taming of our tongues. That is what the prophet Isaiah says in today’s First Reading. God has given him the tongue of a teacher so that he can speak words that are not merely his words, but God’s words. The prophet speaks to the Israelites when they had lost all hope in the exile of Babylon. When we like them are without hope, tongues wag. We bitterly complain about our plight, maliciously gossiping about others, pathetically hoping to improve our lot at the expense of others. Nevertheless, even though we deserve to be taken to the woodshed and given a tongue-lashing, God chooses to bite his tongue. God delivers Israel from exile. God keeps God’s promises. God goes even to the cross, bearing the sin of the world, becoming the object of scorn and anger as tongues wag and voices scream for his blood. Instead of getting back and getting even, the God’s tongue shapes words we never thought were possible: “Father, forgive them for they know not what they do.” In spite of our malicious envy, insidious gossip and all the vicious wagging of our tongues that have mercilessly torn apart the good names of others, God forgives. God gives us new hearts. God gives the faith to believe in spite of appearances to the contrary that we are the apple of God’s eye and the crown of God’s creation. I would be lying to you if I said that it was easy. It isn’t. It is a constant struggle. We are constantly tempted to go our own way and join the feeding frenzy of gossip. Jesus speaks of that struggle in today’s Gospel. Following Jesus means bearing his cross. Following Jesus means following Jesus to the cross. It means that we get to “die” and give up our attempts to make a name for ourselves. Peter tried to talk Jesus out of it. Peter wanted to Jesus to make a name for himself so that Peter could have a name for himself. Jesus will have none of it. He will not be talked out of going to the cross. Jesus did not need to make a name for himself like we do. He knew who he was. He trusted the promises of his Father. This is what you do when you are determined to love tongue waggers and slanderous gossips like Peter and like us . . . no matter what. You let go and let God. That is what Jesus did. And God raised him from the dead for doing it. Jesus invites is to follow him to the same cross and resurrection. We can die. We can let go of the doubts and fears. We can let go of the envy and suspicion. Because Jesus has promised to take hold of us and lead us out of the tomb . . . and beyond. With Jesus holding on to us, we can let go. We die and take hold of our new way of life. Living that way seems foolish. Nobody lives like that in the world we know. Except for the One who has chosen us to follow him. Look where it took him. We get to follow him to the same blessed place, all along the way . 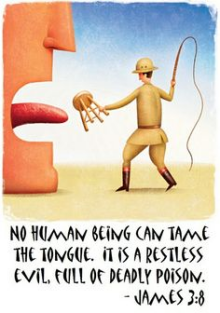 . . taming our tongues.